There are 365 guest rooms and suites. Among these include Club Level rooms, a variety of Suites, Ocean View and Resort View guest rooms, and the ocean front residences at the Reserve. Please see menu above "Ritz Carlton Grand Cayman Room Types" for more detailed information on the accommodation on offer. 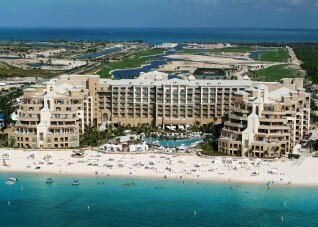 The Ritz Carlton is located on Grand Cayman in the Cayman Islands. The hotel is located 15 minutes from Owen Roberts International airport. The Ritz Carlton Grand Cayman is an exclusive beach front resort on 7 mile beach on the island of Grand Cayman in the Caribbean. Offering the highest level of relaxation and luxury, this beach resort sits on 144 acres of private land stretching from the Caribbean Sea to the North Sound Sea. It is also able to boast being a AAA Five Diamond Property. 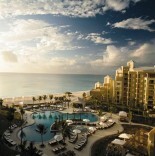 At the Ritz Carlton Grand Cayman there are 365 guest rooms and suites. There is a wide variety of accommodation to choose from ranging from standard hotel rooms to the most luxurious suites on offer. Not only does this beach side resort offer hotel facilities, however there is also the Reserve. The Reserve consists of 24 exclusive ocean front condominiums for people who want the privacy of a vacation home, but still with the facilities of a resort. The Reserve is perfect for families who want more spacious accommodation than a hotel room or suite. The condominiums are 2 or 3 bedrooms, and have a fully equipped chef’s kitchen, spacious balcony, ensuite bathrooms, 24 hour Reserve Concierge, butler service, private entrances and pre-arrival grocery shopping. Please see side menu Room Types for more information on the rooms and suites available for guests. The Ritz-Carlton, Grand Cayman is home to the Seven Wonders on Seven Mile Beach, a collection of luxurious resort amenities from the leaders in their respective fields. The Seven Wonders include a fine dining restaurant by Eric Ripert of New York’s top ranking Le Bernardin , Silver Rain, a La Prairie Spa, Blue Tip, a Greg Norman designed golf course, the Courts with custom tennis programs by Nick Bollettieri, ambassadors of the environment by Jean-Michel Cousteau, the Reserve oceanfront condominiums and the personalized service of nearly 1,000 staff. In addition to standard room rates, there is an additional 10% charge for service, a 10% government tax and a $15 per day resort fee. At the Ritz Carlton Grand Cayman there is a fully equipped business centre which offers computers, fax, photo copying and Internet services as well as the comprehensive services of a professional support staff. Both wired and wireless Internet is available in all guest rooms as well as wireless coverage in public spaces. 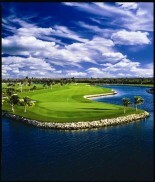 Other amenities of the resort include five restaurants including one by Eric Ripert of Le Bernardin, Silver Rain (a La Prairie Spa), a tennis center by Nick Bollettieri, Ambassadors of the Environment by Jean-Michel Cousteau, Blue Tip (a Greg Norman-designed nine-hole golf course), more than 13,000 square feet of meeting space including the island’s largest ballroom, an executive business centre, two outdoor pools and an oceanfront Spa Pool, a comprehensive water sports program, beauty salon and fitness center, Wave retail shop and a Tiffany & Co. boutique.